Did you know that everything is negotiable? Unfortunately, most people are poor negotiators, and the number one reason why can be traced back to early childhood. This audio series can help you change that. Whether you are trying to influence or negotiate with your largest client, boss, spouse or even one of your children—you need to be skillful. Do you think it might help to be better at reading body language? Would it be beneficial to know how to overcome the most frequently occurring miscommunication problem? Would knowing exactly how someone can be persuaded, be helpful in your interactions? Well now you can! Listen as the experts reveal their secrets so you, too, can succeed. TOM MARCOUX helps people accomplish big dreams. Tom guides audiences (IBM, Sun Microsystems) on job interviewing, public speaking, media relations, and branding. With a degree in psychology, Tom guest lectured at Stanford University and California State University. Winner of a special award at the Emmys, Tom directed and produced a feature film at the Cannes film market, and the film gained international distribution. LAURA STACK, MBA, CSP is a personal productivity expert, bestselling author, and professional speaker whose mission is building high-performance productivity cultures in organizations. She is the president of The Productivity Pro®, Inc. and the 2011-2012 President of the National Speakers Association. She has been a spokesperson for Microsoft, 3M, Xerox, and Office Depot. 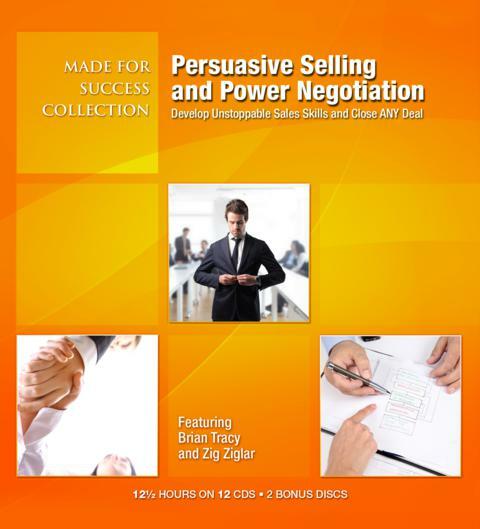 ZIG ZIGLAR, world renowned author and speaker, has an appeal that transcends barriers of age, culture and occupation. Since 1970, he has traveled over five million miles across the world delivering powerful life improvement messages, cultivating the energy of change. Mr. Ziglar has written twenty-three celebrated books on personal growth, leadership, sales, faith, family and success. Nine titles have been on the bestseller lists; his books and tapes have been translated into over thirty-eight languages and dialects.